I love teaching tricks to my parrots. It is not only a load of fun, but it also goes to develop a wonderful relationship with my pets. 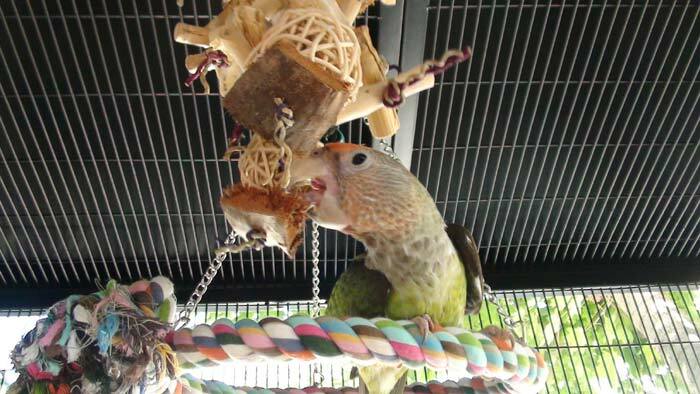 Birds that excel at doing tricks also excel at being good pets. But also from the parrot's perspective, I am fun to be around because all of the treat earning opportunities only happen in my presence and through cooperation. It's a win/win situation. You have already heard about training techniques for many cued parrot tricks on this Trained Parrot blog. Now I am preparing a series of videos describing how to teach all of the prop tricks that I offer for sale. The wonderful thing about trick prop toys is that they are extremely visual, challenging, intelligent, and a ton of fun. The easier tricks are a chance to get the parrot to do something big while still being a beginner at training. The more difficult ones challenge your parrot's intellect and demonstrate a level of intelligence you don't get to experience in other kinds of pets. Let me run down the different tricks available and briefly mention the features and challenges with each. I am listing these in the order I recommend teaching them from easiest to hardest. Birdie Bowling - This was Kili's first prop trick (first video). It is very impressive and exciting to watch, yet it is one of the easiest prop based tricks to teach! It's only a matter of teaching the bird to push the ball, the toy and gravity do the rest of the work! Birdie Basketball - The staple of bird tricks. The basketball trick is probably the easiest but by no means unimpressive of the fetch based tricks. I recommend teaching this one first because it requires the least requisite skills. Just follow the steps in my Fetch Guide first and then you're ready to teach basketball. Height is adjustable so you can start low and increase height with progress. Also suitable for small birds because the hoop can be lowered. Comes with an easy to grip training ball and a realistic ball. Birdie Treasure Chest - Every good pirate needs a parrot. And even better yet, a parrot that knows what to do with treasure! The Treasure Chest trick is two tricks in one. A chest for your parrot to put its favorite toys away and a piggy bank to save up for big treats. This trick is great for beginner and more advanced birds when it comes to training. Birdie Darts - Another easy/exciting sports trick based on fetch. The secret is that the darts are magnetic, so your parrot just needs to drop them by the dart board and they will stick. Have your bird fly with the darts for a long range guided dart! Birdie Slide - Watch your parrot zoom down a slide! A big toy with a stunning visual effect. This trick is actually easy to teach but only for a very tame parrot. The most important thing is that the bird does not get scared of the slide. Once you get past that, it only has to learn to climb the ladder and come down. Birdie Skates - Teach your parrot to skate. This trick does not have any particular requisite tricks but it is difficult to teach. A history of being good at any other tricks will increase the chances of your parrot succeeding with this one. But once taught, it's a lot of fun to see your parrot skating around! Birdie Ring Toss - Color matching ring toss trick. Teach your parrot to put rings on pegs and demonstrate color matching capability. Just the mechanics of putting a ring onto a peg is a whole trick in itself, but with color matching, this trick will stun your friends. Most people have a hard time believing parrots can even see color, let alone be so smart. This is probably the easiest of the color matching tricks I offer. Available in 3 or 6 colors. Birdie Colored Boxes - A color matching tricks that your bird can open and close. 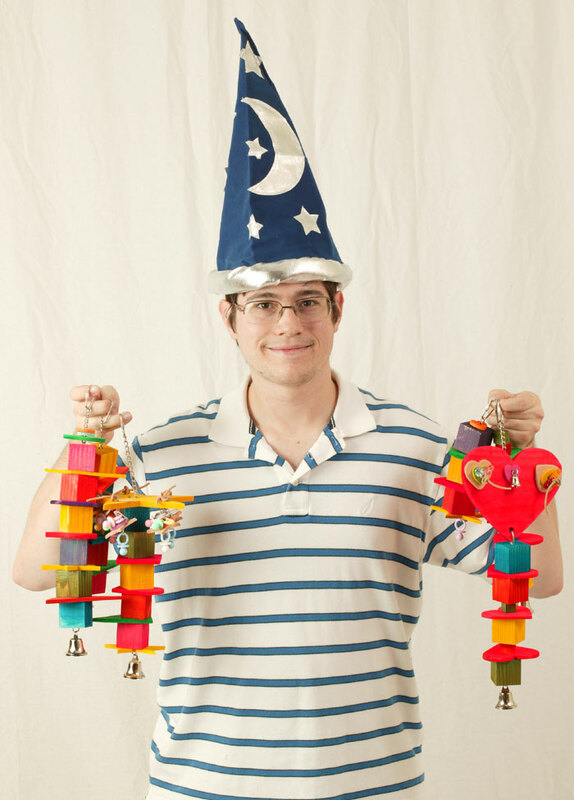 The colored boxes trick is one of the brainiest tricks in my trick toy product line. Not only does your parrot get to demonstrate superior color vision and matching but also handling the box lids. In terms of complexity, it is mostly on par with the ring toss. However, the extra task with the box lids makes it more challenging as a whole. It is more suitable than the ring toss for smaller birds but can just as well be handled by larger birds as well. Birdie Puzzle - Bird can do a puzzle, what more can I say? This trick is colors, puzzles, and tons of IQ aptitude in one. Matching shapes/colors isn't the only challenge. Getting the shaped pieces to fit into the slots requires a good amount of dexterity and skill. Are you up for the challenge? 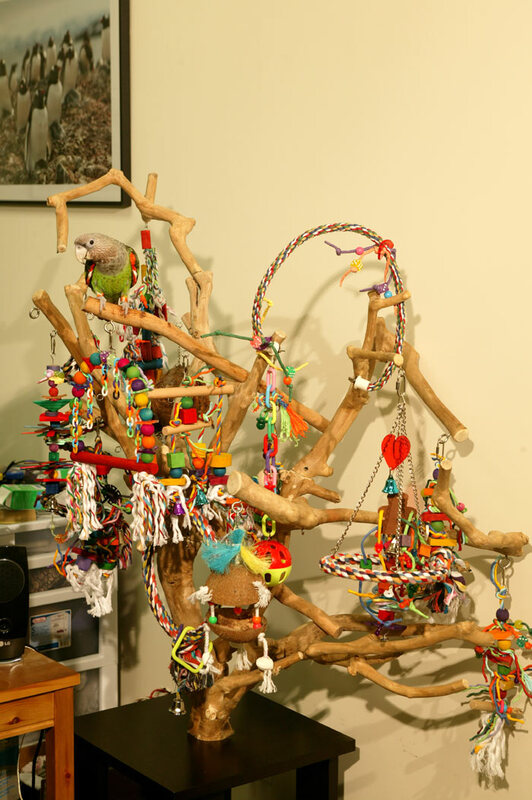 The puzzle is available in 3 different sizes to suit all kinds of parrots. So there you go, 9 parrot trick training props that will keep your parrot trained, educated, and entertained for years! Try and teach them all and I guarantee that with each new trick, you will also develop a better relationship with your parrot. I have been collecting and developing these tricks for years. Now they are all available in one place, ParrotWizard.com. Now enjoy this video of Kili showing off how to do all of them! 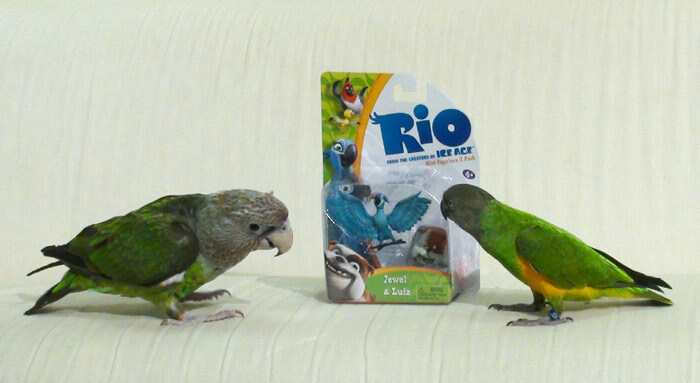 Kili and Truman are excited that there will final be a major feature film about parrots. They're already stocking up on their Rio memorabilia! 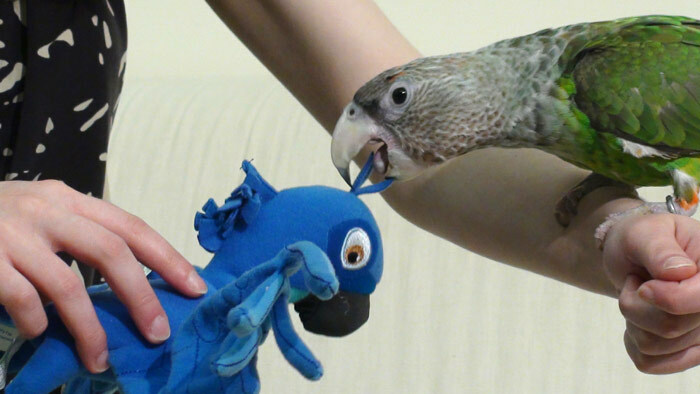 Truman plays with a plush toy of the main character Blu, a rare macaw. Meanwhile Kili marvels at Blu's friend Jewel and wonders how she can get her feathers looking like that. Finally Kili compares her wingspan to Blu and feels quite big about herself. Don't tell her this is just a miniature and the actual character much larger. There has been tremendous hype about the movie for months but it is finally coming to theaters on April 15th. Who is planning to see it? I would like to take the opportunity to announce to you the launch of my new parrot toys and training props brand, Parrot Wizard. 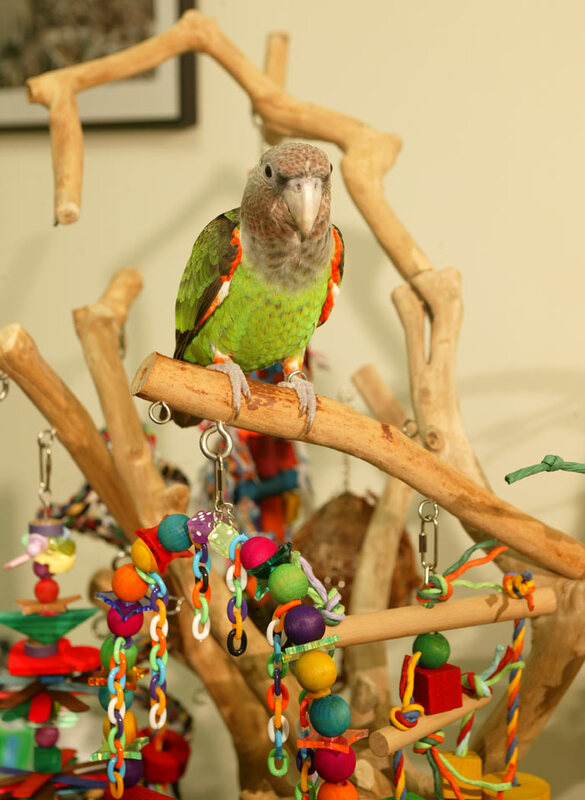 In addition to the Training Perches� with which you are already familiar, I am releasing new parrot toys and training products. Be sure to check out the cool new Parrot Wizard Clickers, the first clicker made specifically for parrot training. No longer will you have to betray your feathered pals by searching for clickers in the dog obedience aisle. These come in a bright red and yellow color with the Parrot Wizard emblem on the back. Now here is the best part. I personally designed, built, and now sell this sweet Valentine's Day parrot toy called My Chew Love�. Since this is the first toy I am selling, I'm offering it for 50% off the full price to entice you to try my products. You won't be disappointed! I've already let Kili and Truman play with this toy and they went bonkers for it. 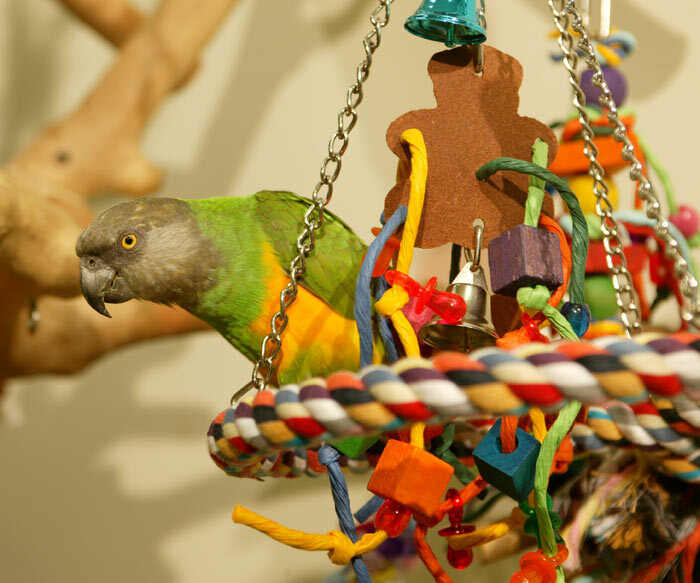 The heart shaped toy has a variety of pieces in different colors and sizes so that any parrot could enjoy it. It's a one size fits all toy so to say. 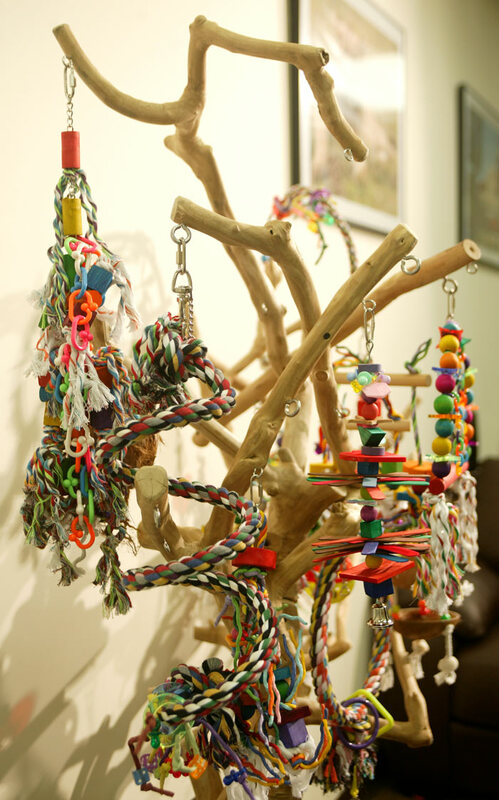 The smaller parrots such as Senegal Parrots, Conures, and Cockatiels, will appreciate the leather knots, mini hearts, and little pacifiers. Meanwhile larger parrots such as African Greys, Cockatoos, Amazons, and Macaws can chomp down the bigger blocks and hearts with ease. So here's a fantastic gift idea to express your love to your parrot and at an incredible price too. Order soon to receive in time for Valentine's Day. 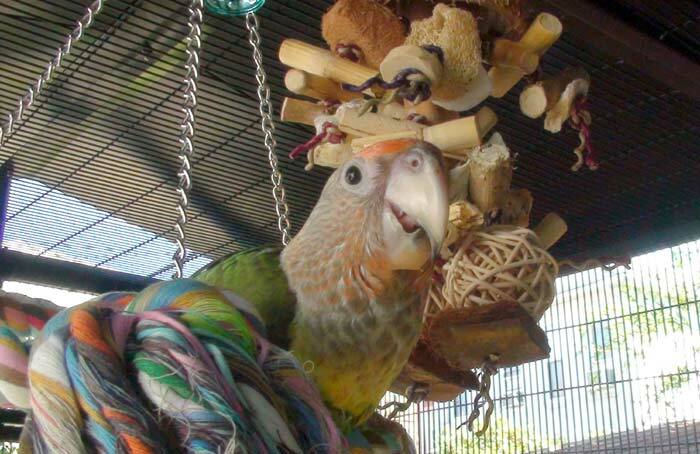 Visit www.ParrotWizard.com and check out all the parrot toys I've come out with. Many more are coming soon. I will also be releasing props for trick training so that you can follow along some of the prop based tricks I will soon be training to Truman. 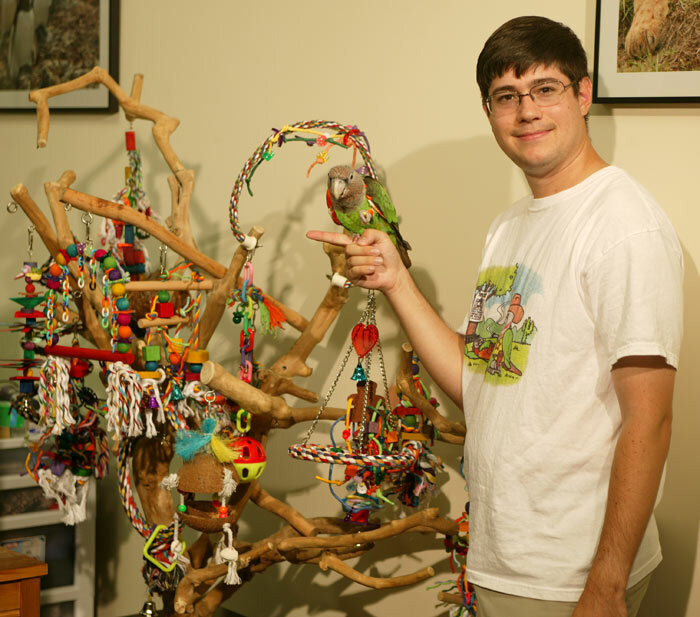 I'd like to thank all my customers, readers, and viewers because without your ongoing support and feedback I would not have had the motivation to attempt to publicize my own line of parrot products. I made these for you and I really hope they bring love and joy to you and your flock.